Ambivalence is the name of the game for me this week. Really, mostly, I don’t know what to think. Or, at least, until I sat down to write, I didn’t quite know what I thought. There was that missed tiddler by Sergio and all the hooha about what was equitable, what his opponent Matt Kuchar should or shouldn’t have done. Of course, in normal circumstances, Kuchar would have conceded the putt but Sergio, in a fit of irritation, dragged the ball back and didn’t give him a chance. The Spaniard, who won the Masters title two years ago, seems to have ditched most of the maturity that he displayed that April and has been behaving like a bit of an eejit so far this season. Battering greens and bunkers in temper and behaving like a man on edge, who knows why? 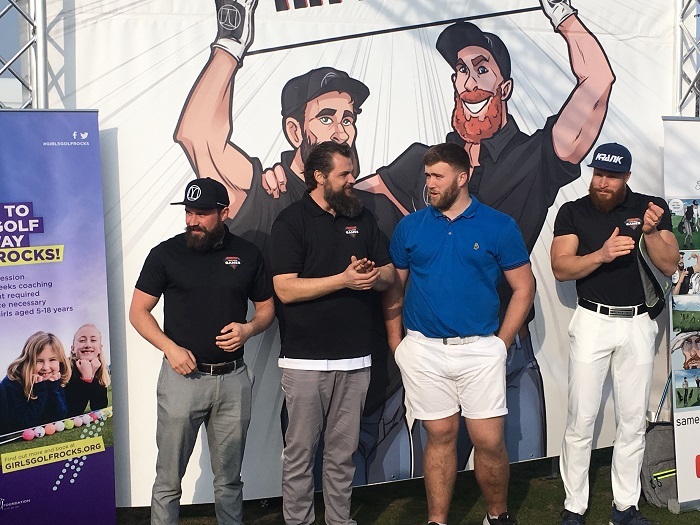 No room for ambivalence or holding back when you’re competing in the European Long Drive Games. Lots of people seem to think that Kuchar should have levelled things up by conceding something later on and there were scornful comments about golf and its pernickety rules and I swithered, not sure what I would have done in the circumstances. And you know what? I don’t think I’d have given Sergio anything apart from a shrug and some sort of semi-sympathetic grimace. He’s a seasoned professional, a major champion playing in a big event, not a 54-handicap beginner who doesn’t know any better. Toddler temper tantrum, loss of hole, end of story. And none of my money on Sergio to win another green jacket. That brings me to the much-lauded Augusta National Women’s Amateur, hailed as a breakthrough for women golfers worldwide. The trophy is lovely, classy, as one would expect but, really, doesn’t the hype exceed the reality? In case you hadn’t heard, the event was announced by Fred Ridley, father of three daughters and newly anointed chairman of Augusta National GC, at the Masters last year. 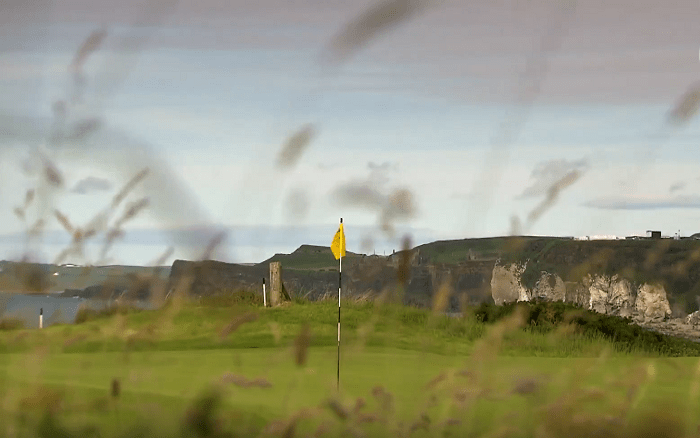 Women to play a major event at ANGC? Wow. Was there a blue moon or something? Were pigs flying? Had hell frozen over? 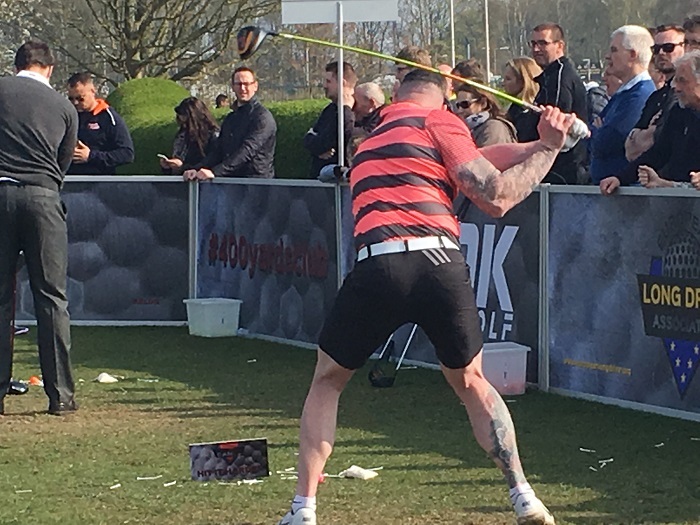 Joe Miller, twice the world long drive champion, demonstrates the art of the backswing. More importantly, had Fred discussed it with anyone else? 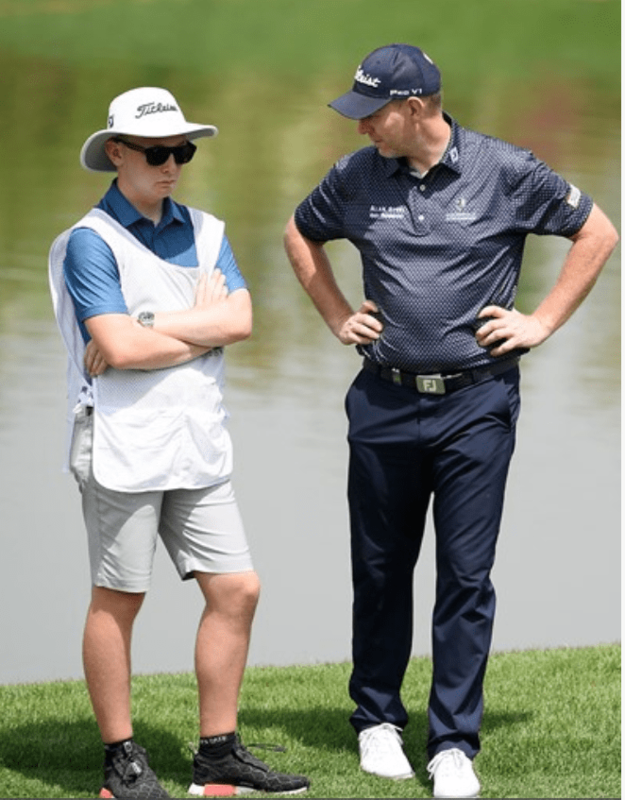 Had he consulted Mike Whan, commissioner of the LPGA Tour about the clash with the ANA Inspiration, the first major championship of the year, an event that traditionally included the best women amateurs? Had Fred, good intentions notwithstanding, really thought it through? As it turns out, the first two rounds of the 54-hole event were at a course called Champions Retreat, with 30 players (out of 72) qualifying for the final round at Augusta National on Saturday. 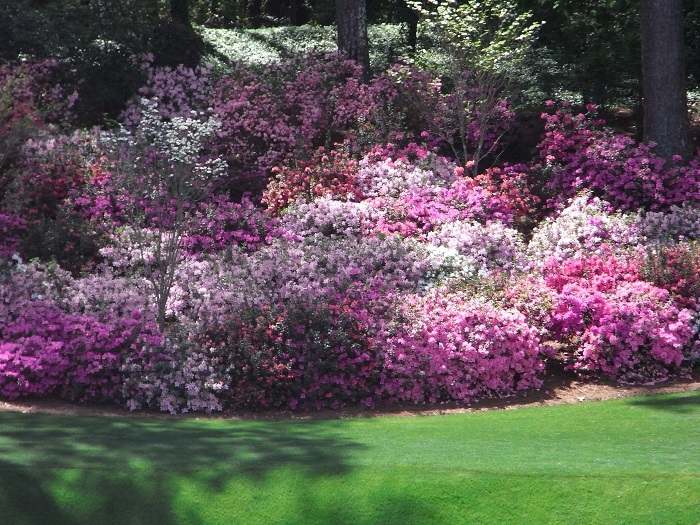 In a quaint quirk, all 72 players get to play at Augusta National today (Friday). Mmmmmm. Nancy Lopez, Lorena Ochoa, Se Ri Pak and Annika Sorenstam, legends and good people all, are endorsing the new event and gracing it with their presence, so how can I condemn it? Perhaps it will herald a new era for women’s golf but if I had to sum it up in one phrase it would be “crumbs from the rich man’s table”. And one word? Patronising. Or, since it’s in America: patronizing. The winner won’t care but there’s still work to do, Fred. And perhaps the clash will encourage the ANA Inspiration to live up to its name – and its origins as the Colgate Dinah Shore – and be inspired to up its game. The Dinah started in 1972 at Mission Hills in Rancho Mirage, California and it blew every other event off the fairways with its (for the time) massive prize money, glamour and exposure. It’s still at Mission Hills and has long been elevated to major status but for too long it’s traded on its reputation; its prize money has gone up but lags behind most of its fellow majors and, frankly, it now lacks glamour, exposure and inspiration. Work to do there too. Wonder if Fred and his cohorts, as promoters of the women’s game, could help. Meanwhile, at the Ayla Golf Club in Aqaba, Jordan, there’s the unique Jordan Mixed Open presented by Ayla, where the Ladies European Tour, the European Challenge Tour and the Staysure Tour (European Seniors) are competing on the same course (albeit the yardages are different) at the same time. Daan Huizing, a Challenge Tour member from the Netherlands, had a 64 in the first round to lead by one shot from the English duo of Jack Senior, another Challenge Tour man and Meghan McLaren (LET), whose father David is currently in charge of the Staysure Tour and is happy to confess that all the women in his family are better golfers than he is. The event’s hashtag is WeShareTheSameDrive. So, golf really is for all. 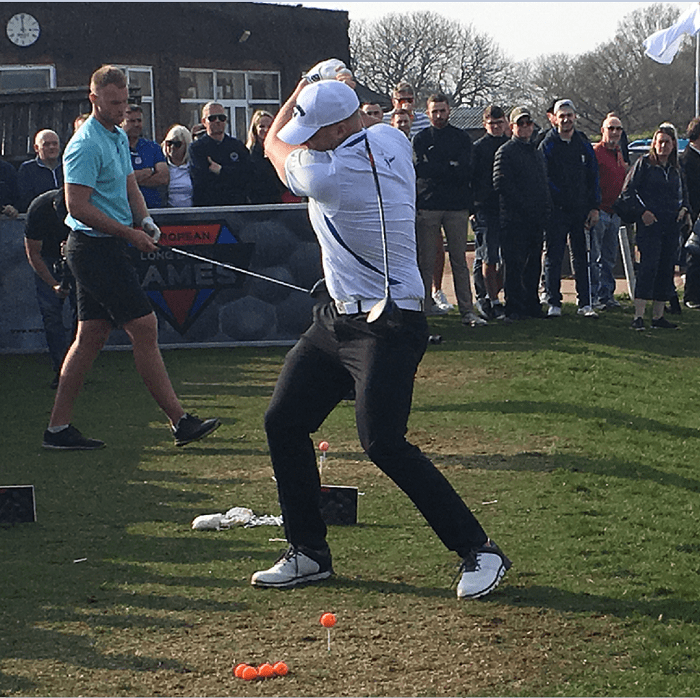 Last Friday and Saturday at Whittington Heath GC, we had great fun with some of Europe’s best long drivers competing in a round of the European Long Drive Games and showing us some amazing moves (see pics). It was a bit cold with a bit of a breeze, so no one quite beat the 400-yard mark but there was a lot of jaw-dropping hitting, some of it accurate enough to be measured! They brought 1000 balls with them, in a variety of colours and they were battered to blazes as the music blared out. If you get a chance to go and watch these big hitters, take it. It’s great fun. WHGC’s Jordan (blue shirt, beard in progress) didn’t win this time but took the plaudits for making it all happen. Note the poster on the left. Golf really is for all, big and small.